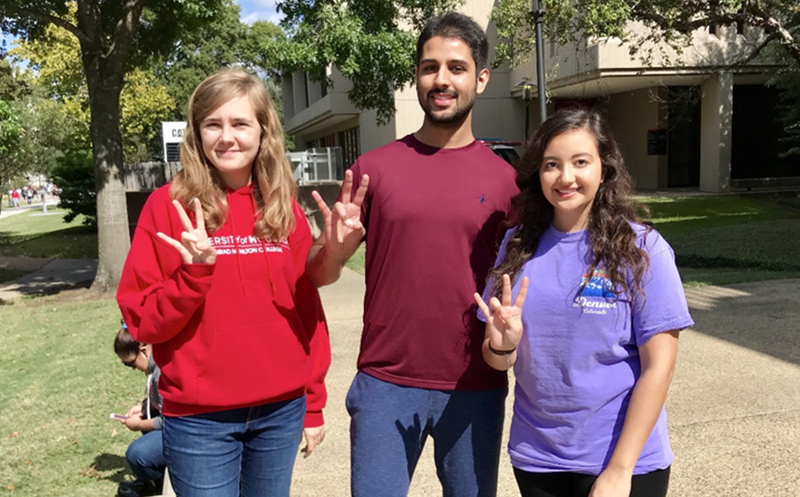 On Oct. 19-21, three members of the Eta Sigma Delta International Hospitality Management Society (ESD) – Iuliana Popa, Parmveer Lidhar and Maya Hajjar (pictured from left) – represented Hilton College at the Community Innovation Challenge, where they pitched a plan to help make fresh, quality meals and produce accessible to families in Houston’s Third Ward. The students were chosen to participate based on their competencies, interests and motivation, said Dr. Priyanko Guchait, ESD faculty advisor. The competition, hosted by the student organization Houston Innovation Ventures & Entrepreneurship (HIVE), aimed to bring together teams from the University of Houston in a collaborative event to solve real-world problems faced by the city in the areas of public health, public safety, education and mobility. It was held in partnership with the University’s RED Labs and the Mayor’s Office of Innovation. Each team received their challenge during the first day of competition, with Hilton College given the task to create a policy that could improve any aspect of health in the Third Ward. After a weekend of brainstorming, the team formulated a plan using the College’s research about “ugly produce” for inspiration. Because of their appearance, “ugly produce” is often discounted or discarded despite being fit for consumption. Instead of dumping these products, the students proposed establishing a public-private partnership between governmental entities and businesses that would utilize this ugly produce to provide healthy, affordable meals for students in public schools, including ready-made dinners to take home.